It’s time to start another subject in our series 19th Century American Maritime. For the next three months on Wednesdays, we’ll be talking about lighthouses. Today, we’ll start with a very quick review of some lighthouse history, going back to ancient times, the middle ages, and the early modern era. We’ll briefly discuss the importance of lighthouses and conclude with a short introduction to lighthouses in America. Of course, in the following weeks, we’ll delve more deeply into American lightkeeping. Why lighthouses? Hint: a new novel – coming soon! The earliest form of shore lights in any civilization would’ve been beacon fires, lit along the shore or cliffs to warn or direct ships at sea. There’s evidence that there were forms lighthouses along the Mediterranean coastlines and harbors in the ancient world. From the days of the Roman Empire, historians have verified at least 30 official lighthouse locations. In fact, one particular “lighthouse” stood at the entrance to Alexandria Harbor (Egypt) and was one of the Seven Wonders of the Ancient World. 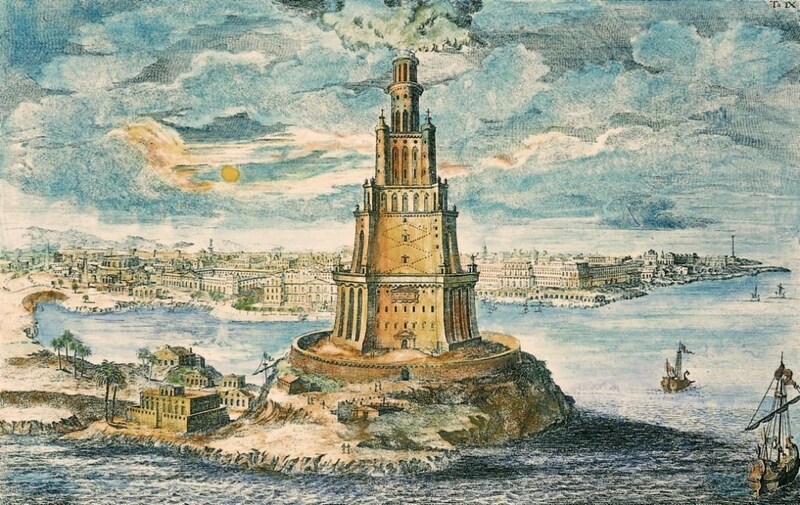 Historians of antiquity believe the Pharos Lighthouse construction began around 300 B.C. and finished it about twenty years later. It’s suspected that the tower was about 450 feet high and the light source was an open flame. The Pharos Lighthouse was illuminated for about 1,000 and then stood for an additional 500 years before crumbling in an earthquake. 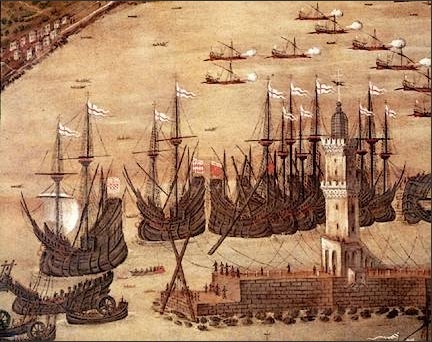 Artwork from 1481 showing Genoa (Italy) Harbor. The tower may be a light beacon or it may be for defense. Or both! As commerce increased after the Dark Ages, European merchant ships ventured abroad, establishing trade routes. To increase maritime safety, light beacons were established along the coasts of Italy, Turkey, France, England, Ireland, and Germany. The first known “lighthouse” in this time period was constructed in Meloria, Italy, 1157 A.D.
Interestingly, some of the port cities were guarded by castles, and in some cases, a castle turret became the elevated platform for a fire or other form of light beacon. As commerce continued to increase during the Early Modern Era, more “lighthouses” appeared along the coastlines. For example, estimates place 34 coastal lights on the shores of Britain in 1600 A.D. but by 1800, there were approximately 175 lighthouses. 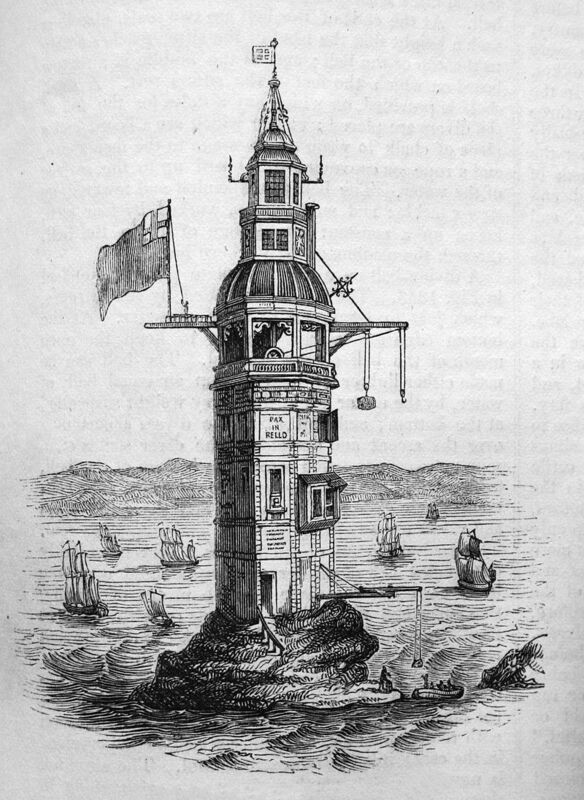 A sketch of the 1699 version of the Eddystone Lighthouse. Notice how it sits directly on the rocks, completely surrounded by water. Two famous lighthouses were built in Europe at this time: Eddystone Light (1689) and Inchcape (Bell Rock) Light (1811). Both were engineering masterpieces! Built on dangerous, wave swept rocks, it was a challenge just to get to the locations safety, then anchor a building foundation securely on the wet rocks, then construct a tower that would stand. What’s the purpose of a lighthouse? First, let’s be clear what it’s not. A lighthouse does not tell mariners to come close and find safety. A lighthouse is a warning beacon, a navigational guide. A lighthouse marks location along a shore, helping mariners avoid danger (not steer toward it! ), guides them into the harbor by signalling where the shoreline is, and provides a point of reference to ships farther out at sea. The United States has an interesting and unique lighthouse history. Just saying “lighthouse” probably conjures up a quaint, peaceful image of a light-giving structure set picturesquely along the seaside. (Or something like that?) While it’s certainly true that lighthouses are beautiful structures and each one different and special, a lighthouse served/serves a specific purpose: navigational guide and warning. That core purpose of a lighthouse is what makes them classic in stories of America courage and valor. It’s a far different picture than the courage from military history, but as I think you’ll find in the coming weeks, keeping a lighthouse was/is a vital part of protecting American lives. From the early 1700’s to the modern era, lighthouses have played a steady, faithful part in the history of American maritime. No discussion of U.S. Maritime in the 19th Century would be complete without facts and details about the lighthouses, the keepers, the lighthouse administrations, and some stories of courage. P.S. Have you visited some lighthouses? Which ones? I have visited 4 lighthouses in North Carolina. Cape Lookout Lighthouse – took boat to visit. Ocracoke Lighthouse on Ocracoke Island – lighthouse still in service, took free ferry from Cape Hatteras. Cape Hatteras lighthouse – the tallest on the Atlantic coast, famous for being moved inland while intact. 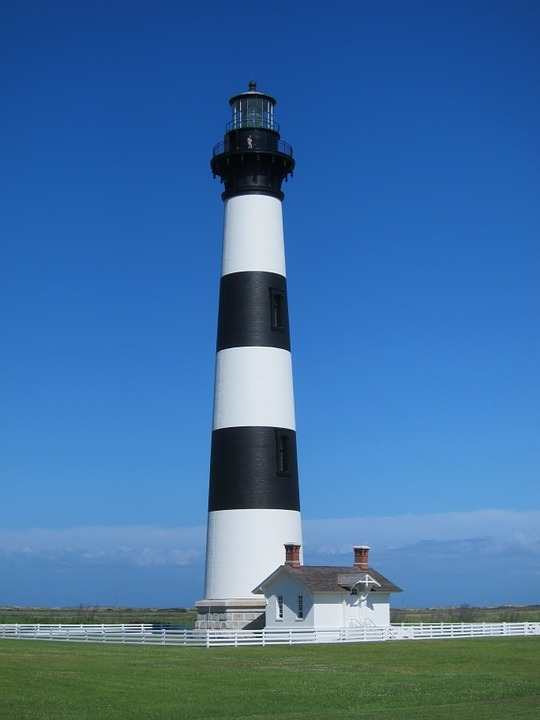 Bodie Island Lighthouse – easy to visit, open land. I, also, visited a life-saving station at Chicamacomico in Rodanthe, North Carolina. Thank you for writing your new book. You are my favorite author, Sarah. Look forward to receiving my copies. Those sound like wonderful lighthouses. Thanks for sharing and I looked forward to sending your autographed books as soon as they arrive from the printers.